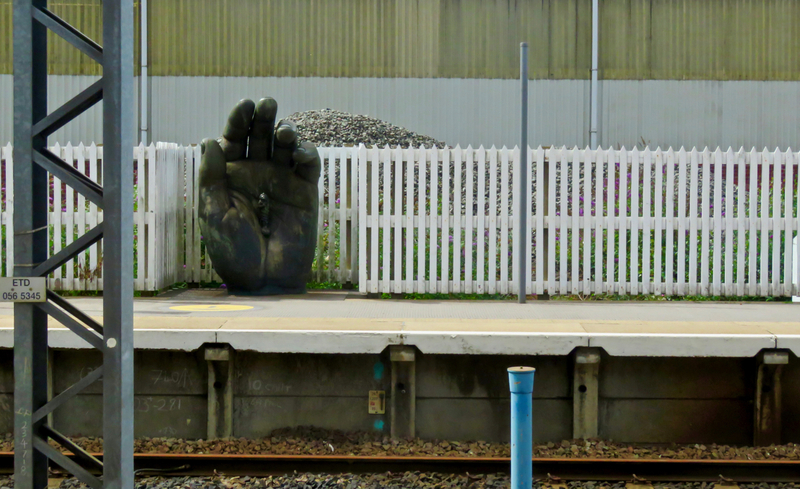 Finding myself on Stoke-on-Trent railway station for half an hour today, and time therefore to ponder this sculpture: not so much why is it there at all (for there should be more public art if you ask me), but why tuck it down the very far end of platform 2 where hardly anyone ever goes? The blue post may seem an intrusion but I like it. 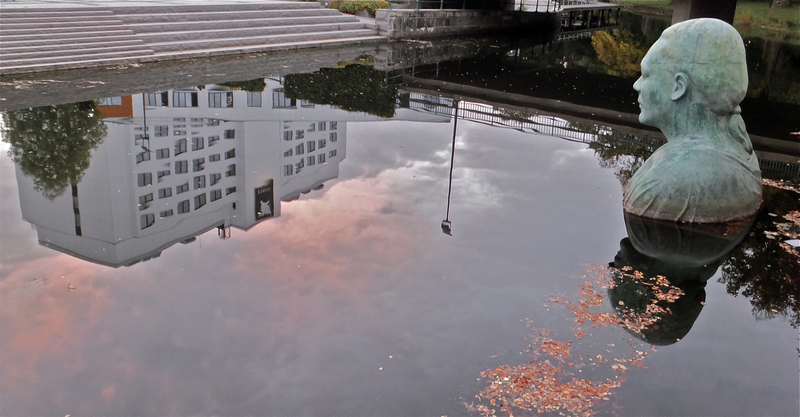 The photo becomes a study of the various lines going both across and down. 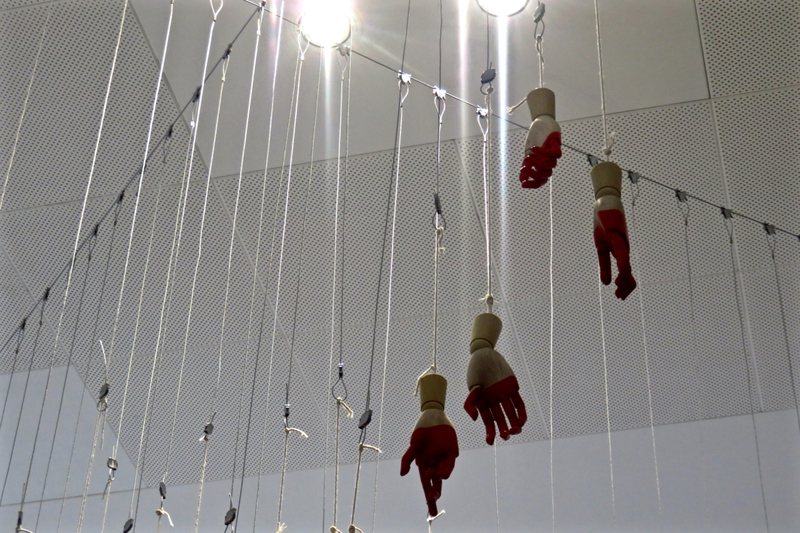 What significance this sculpture has, I have no idea — it currently hangs above the gift shop of the British Library. I guess I should invent some meaning…. but it’s the weekend. A day’s work in London to finish off the week (and it did finish me off). This creation was being put together outside Holborn tube station as I passed, and was proving quite a profitable enterprise for its sculptor — justifiably. 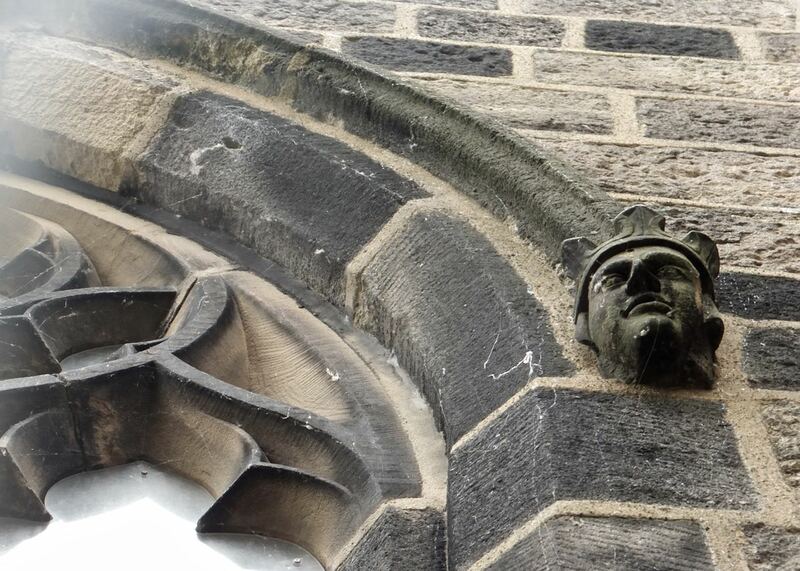 That is the name of this sculpture, currently residing in the courtyard of the town hall. There is a page about it here. It’s made of sand, and if you compare the photos on that web page with this one you can see that she has been revised (she is aging), and apparently will continue to be at points over the next few weeks. It’s a clever idea. Even if you can’t see it from most of the town. I may not have mentioned I am in Rome this week, but here we are — the 19th country to appear on this blog in its three years (and the 20th will come on Friday, if the schedule works out). Expect to see more than one ancient Roman monument appear on this site over the next few days, I love all this stuff. This is Trajan’s Column, erected to commemorate the victories of the eponymous emperor in Dacia, modern-day Romania (hence the name of that country). 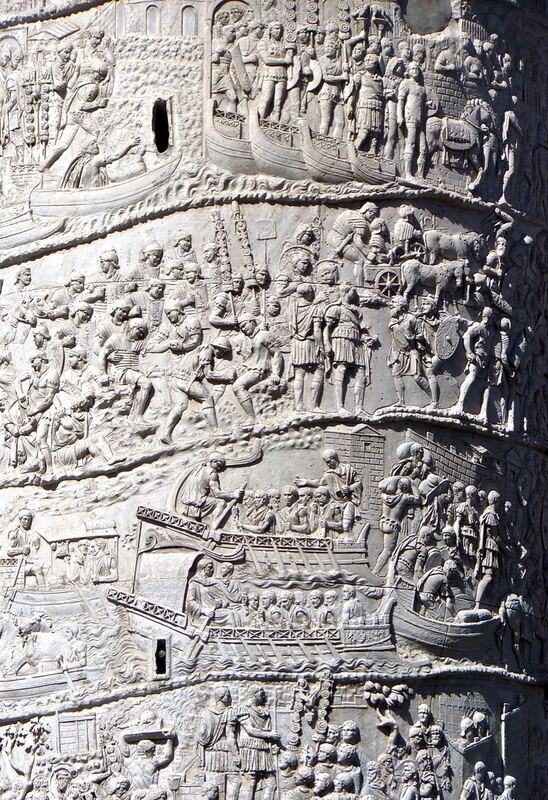 The column is 30 metres high, and the carvings on it form a continuous frieze of nearly 200 metres long, with lots of detail depicting Trajan’s victory. Note the heads on spears in the centre of this image. Well, here I am in another new country for me – Sweden. I won’t see much of it, being here for under 48 hours all told, and just in this one small city, Borås, which is in the south of the country, not far from Gothenburg. Its claims to fame, so I can tell or have been told, are that — it is the home of the country’s most prestigious Library and Information Science School (this is why I’m here); is the textile capital of Sweden; it is the home of IF Elfsborg, football champions of Sweden in 2012; and it has a lot of sculpture, including this rather tasteful piece of work not far from the bus station, known, apparently, as ‘Bodhi’ (meditator). As of yet however, I have failed to find any particularly good beer here. Which is also worth noting. Went here for a meeting today, it’s not a particularly exciting place but unlike the last time it featured on the blog in December, Blackburn at least delivered a) good weather and b) the event I actually came to the town for. I have no idea what this sculpture commemorates, but perhaps it doesn’t commemorate anything and is just some public art. Which is fine. That’s a teddy bear the boy has dropped, by the way. Incidentally it is also a year to the day since what was certainly the least pleasant day I had to somehow document on here: the flash flood of 9th July 2012. I went into Manchester today, but don’t tell anyone — officially I don’t go back to work there until early September. But there were reasons to go in today, which went beyond the desire to have the first Manchester photo on the blog since day 504 of the blog, 10th January, 159 days ago. 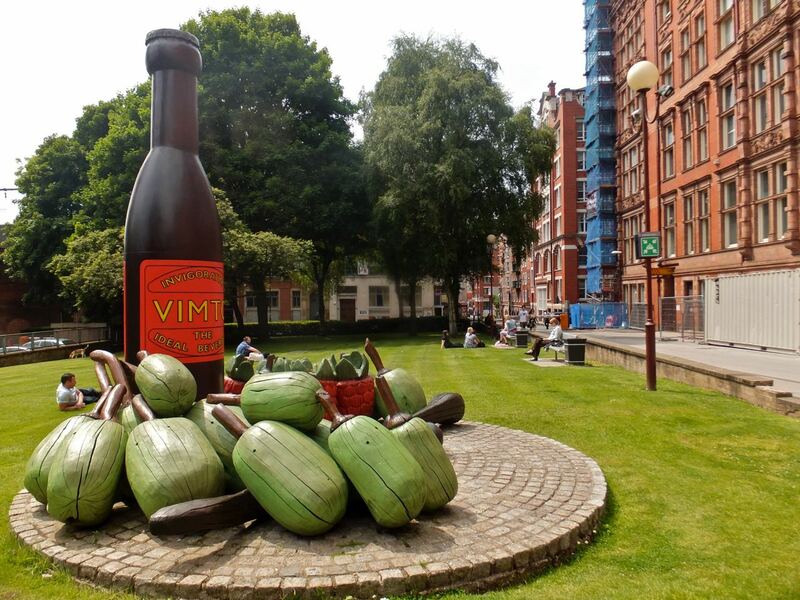 This sculpture sits outside the university’s monumental Sackville Street building and pays homage to the local non-alcoholic beverage, Vimto, an anagram of, well, you can work it out. 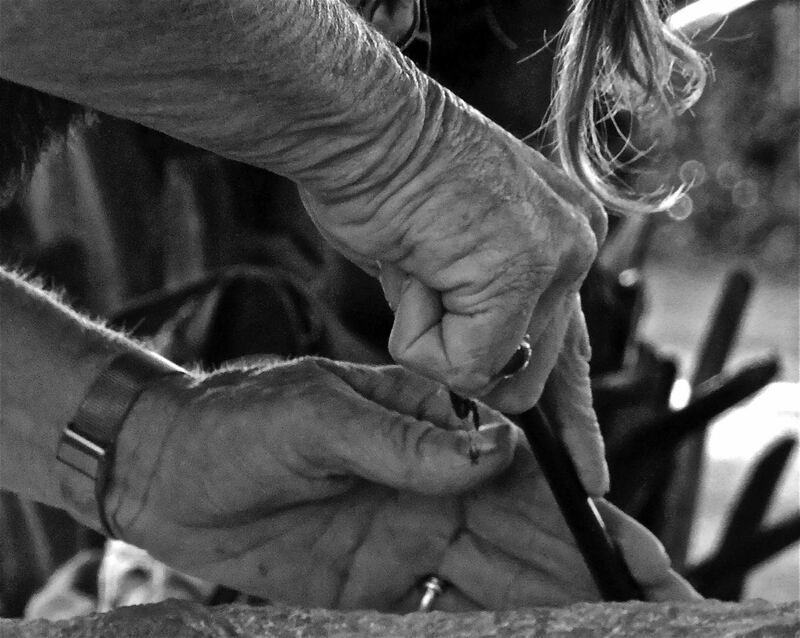 Nimbin is what the tourist guides will call a ‘countercultural centre’, which has been the case since the Aquarius festival there in 1973. 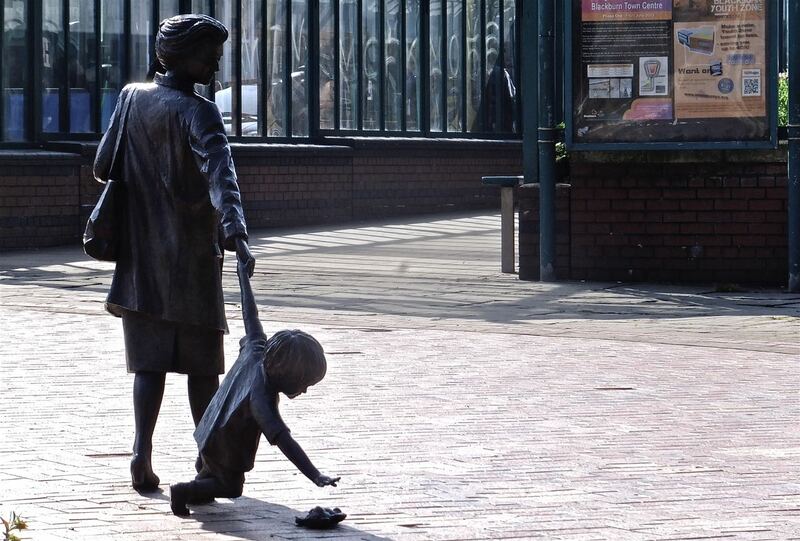 This lady was one of a group who were carving sandstone lumps into great sculptures and then just leaving them in the patch of ground where they lay. That’s Nimbin for ya. I liked it.